As practitioners in the field of elections, both EMBs and CSOs have grappled with the demanding task of ensuring the delivery of credible, free and legitimate elections in their respective countries in the absence of a standard tool with which they could measure their success or otherwise. Principles for Election Management, Monitoring and Observation in the SADC Region (PEMMO) was the culmination of three years of hard work to develop such a tool and involved a great deal of research and consultation in the region. PEMMO covers the whole period before, during and after the poll. PEMMO also provides guidelines on the conduct observers during the electoral process. PEMMO was first adopted at a SADC regional conference held in Johannesburg, South Africa on 6 November 2003 under the auspices of EISA and The Electoral Commissioner's Forum of the SADC. Subsequently these election principles have served as benchmarks on for observation, monitoring and assessment of elections in the SADC region from 2004 onwards. PEMMO has, beyond election management, monitoring and observation, informed and inspired post-election reviews and election reforms in the SADC region and inspired the development of similar tools in other regions of the globe. PEMMO was launched in numerous SADC countries, including Botswana, South Africa, DR Congo, Mauritius, Madagascar, Namibia and Zanzibar. In Malawi EISA provided training on the PEMMO to the supervisors deployed by the Malawi Electoral Support Network (MESN) for the May 20 Presidential and Parliamentary Elections. 60 members of the network were trained. In Botswana, EISA provided technical and financial support to the Botswana Electoral Support Network (BESNET) which is made up of members of the SADC ESN. EISA supported BESNET in developing a training and deployment strategy for monitoring the Botswana Parliamentary and Local Government Elections held on 30 October 2004. 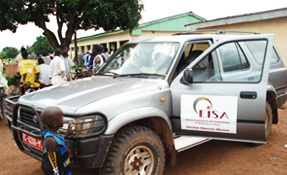 In addition EISA also provided materials for use in the training of observers. BESNET deployed 300 observers during the election. In Namibia EISA worked with the Namibian NGO Forum (NANGOF) to provide technical and financial support for the training and deployment of election observers for the Namibia National Assembly elections recently held on 15-16 November. Over 200 observers were trained and deployed for the elections. After launching the PEMMO in Mozambique, wide distribution of the Portuguese version of the document commenced through ESN members. A select group of domestic observers were trained in PEMMO.